Guanyin (Avalokitesvara) is a compassionate Buddhist saviour. 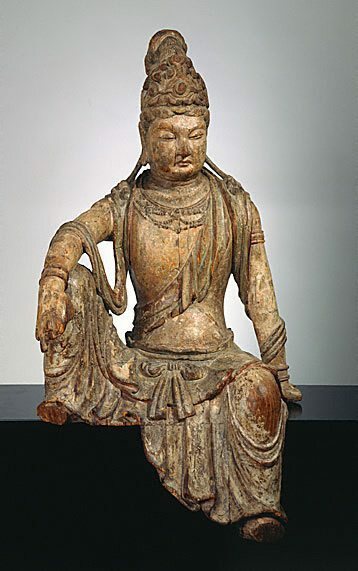 Initially a male divinity, over time across East Asia Guanyin has often been presented in female form. Rather than pursuing Buddhahood, the merciful bodhisattva vowed to remain on earth until every sentient being achieves enlightenment and rebirth in the Buddhist paradise. Traces of colour remain on this wooden sculpture which was originally covered with white gesso and paint. Jackie Menzies, Asian Collection Handbook, Art Gallery of New South Wales , 'Introduction', pg. 9-17, Sydney, 1990, 12, 13 (colour illus.). Portrait of a Gallery , 'Asian Art', pg. 106-113, Sydney, 1984, 109 (colour illus.). The Asian Collections Art Gallery of New South Wales , Sydney, 2003, 10 (colour illus. ).